WHEN HAVE YOU GOT SCIENCE? WHEN HAVE YOU GOT MATHS? WHEN HAVE YOU GOT...? Here you have some videos and resources to learn about subjects! Let's learn about space and the Earth. Here you have some links where you can learn about space, astronomers, stars, etc. There are 27 of us in the class!!! 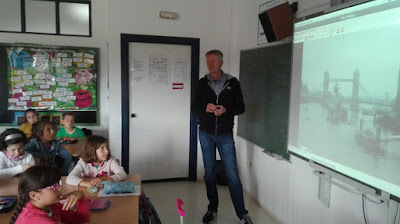 Last Friday Johannes visited our class, 3º B. We asked him some questions about his daily activities when he was a child. It was really interesting listen to him talking about his childhood in Germany and England, the time he got up to go to school, etc. Johannes attended everyone and answered every question. Johannes got a superpoint:), Congratulations!!! We will be waiting for Johannes. Thanks a lot!!! Let's review English with basic dialogues related to our daily activities!!!!! What do you do? Are you a nurse? a plumber? an astronaut? a cook? a firefighter? Guess! Who am I? It's time to learn the time!!!! What do you do every day? What time do you get up? What do have for breakfast? What time do you go to bed? Let's learn vocabulary and practise about our daily rouintes before and after school. The following links are related to the time. Try! Come on! You can do it!